In your zeal to grow the hottest pepper on the block, how many varieties of chiles did you plant this year? 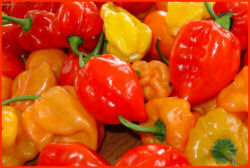 If you're harvesting five alarm peppers by the basketful, with no idea of how you can possibly use so many of these blazing beauties, you need to learn to make hot sauce! Our homemade habanero hot sauce turned out so well it's been splashed (gingerly) onto everything from tortilla chips to scrambled eggs. Last summer was "The Year of the Habanero" at our house. I grew out a dozen different varieties of Capsicum chinense, some of which grew over 6 feet tall against our sunny, warm, south-facing foundation wall. We harvested bushels of bright, blisteringly hot peppers. I gave a lot away, dried some, froze some, and prepared a lot for later hot sauce production. To some, hot sauce can never be too hot. For me, food should have some flavor other than pain. I wanted to reduce the heat of these peppers just a little in order to maximize the fruity flavor and aroma of the habaneros in my hot sauce. Removing the seeds and inner membranes of the peppers will take away some of the heat. 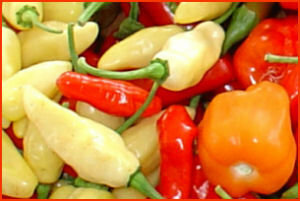 The capsaicin that makes peppers hot to taste can also make them too hot to handle. Take appropriate precautions. 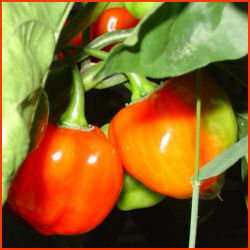 When you're seeding mild peppers such as jalopeños, it's a good idea to wear gloves and to be sure to wash your hands afterwards, especially before touching your eyes. 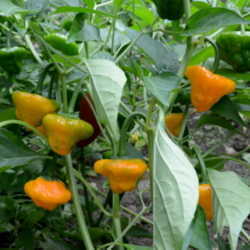 With ultra hot peppers such as habaneros, seeding may require additional protective measures. I use a double set of latex gloves or heavy duty gloves to protect the skin of my hands from serious burning pain. I also keep remedies such as saline eyewash, milk, hydrogen peroxide, and baking soda close at hand, just in case. After I've seeded them, I mince the hot peppers in a food processor. Habaneros can give off some pretty caustic fumes, so I set up my food processor on the (cold) stove top with the vented fan running on "high." I add a measured amount of white wine vinegar or apple cider vinegar and put the minced peppers into a glass jar with a plastic lid. The peppers are then stored in the refrigerator until I'm ready to make hot sauce. I make sure to label the jars so I don't have to rely on my memory: "3 cups ‘Red Savina' plus ½ cup cider vinegar, August 2007." 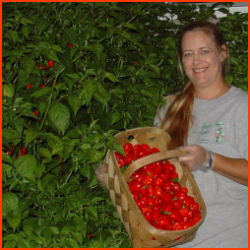 My favorite hot sauce recipe is a tomato based sauce from The Joy of Pickling, by Linda Ziedrich (click the link for my Garden Bookworm review). Since I'm using habaneros in this variation, I actually reduced the total amount of chiles to keep the sauce from being overly hot. 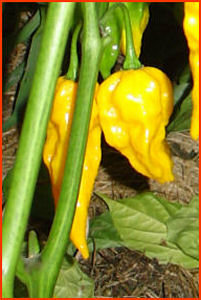 If desired, you could increase the amount of minced habanero to 2 cups for truly volcanic heat. 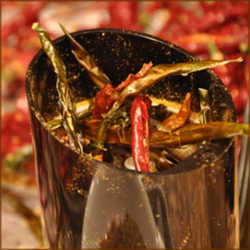 The Caribbean's famous "jerk" seasoning mixture uses allspice and mace, so those spices were added to the teaball of whole spices that simmered with the pot of sauce. We thought the flavor needed a little mellowing at the end, and a splash of rum seemed appropriate to our Caribbean theme. You'll find your own favorite variations as you experiment. Be sure to keep the proportions of the ingredients pretty much the same, especially if you plan to put up the sauce in jars, as that's important for food safety. Because heat processing can change flavor balances and heat levels, we generally opt for refrigerator storage of our hot sauces. Adapted from Linda Ziedrich's "Tomato Pepper Sauce"
Put the tomatoes, peppers, garlic, and 1 ½ cups of the vinegar into a nonreactive saucepan. Put the whole spices (allspice, peppercorns, clove, and bit of nutmeg) into a teaball, or tie them up in a piece of cheesecloth, and add them to the pot. Boil the mixture, stirring occasionally, until it is reduced by half. Take the pot off the heat and remove the spice ball. Purée the mixture. You can use a blender or a food mill. I like to use my little immersion "stick blender" for this, running it around in the pot until the contents look smooth. 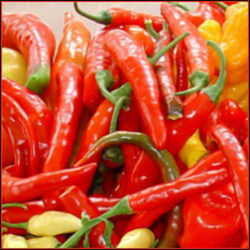 Be careful, because splashing sauce may be hot not only from the stove but also hot from the capsicum in the peppers. Put the purée and the spice ball back into the pot. Add the salt and the remaining 2 cups of vinegar. Bring the sauce back to a boil and cook it down, stirring often, until it's as thick as you'd like. Add the thyme, the cake spice, and the rum, tasting as you go so you can adjust the flavors to your liking. The finished hot sauce can be processed in a boiling water bath (leave ¼ inch headspace and process 15 minutes for pints or half pints) or stored in sterile glass bottles in the refrigerator. The recipe can be doubled or tripled if you have a big pot. I keep a big jar or jug at the back of the fridge and use it to refill smaller bottles for everyday use. Can't take the heat? Don't get out of the kitchen! Check out the milder recipes in last week's article, "Some Like it Hot! Making Hot Sauce from Homegrown Chile Peppers." Photos and recipe variation by Jill M. Nicolaus.